The Playa del Rey area, located about two miles south of Kinney's Venice of America resort, was once, centuries ago, the mouth of the Los Angles River. But after the river shifted course to begin emptying in Los Alamitos Bay in Long Beach, it left behind a sleepy lagoon more than two miles wide and one fifth of a mile wide with a trickle of fresh water flowing to sea along La Ballona Creek. Del Rey Lagoon formed the southwest corner of the 13,920 acre (15 square miles) Rancho La Ballona that stretched inland from the ocean into what is now Palms and Culver City and north to Pico Boulevard in Santa Monica. It was a land grant that was awarded by the Mexican governor in 1839 to Ygnacio and Augustin Machado and Felipe and Tomas Talamantes. After the droughts of the 1860's decimated most of the rancho's cattle, squatters began to infest their huge land grant. In 1871 a German shopkeeper named Will Tell filed a preemption claim on 150 acres of marshy land at the mouth of Ballona Creek. He built a shack at the lagoon's edge and stocked it with food and drink. "Tell's Place" became popular with sportsmen who made the half-day trip by horseback or wagon from Los Angeles. Guests hunted ducks from one of Tell's ten small boats. In 1874, when the widow of Augustin Machado brought suit to evict Tell, he packed up and moved to Santa Monica. However, in 1877 an Irishman named Michael Duffy opened "Hunter's Cottage in Tell's old location. During the late 1880's land boom in Southern California, one visionary named Moye L. Wicks saw the potential of Playa del Rey as a harbor. In 1886 he organized the Ballona Harbor and Improvement Company with a capital stock of $300,000 to dredge out "Port Ballona." The board of directors included James Campbell, H.W. Mills, E.H Boyd, F. Sabichi, Doctor Lotspeich and himself. The company's plans included a 200 foot channel linking the ocean to the inner harbor which would be two miles long, 300 to 600 foot wide and twenty feet deep. After the Santa Fe Railroad broke the Union Pacific's railroad monopoly in Southern California by building a line north from San Diego, they were searching for a major ocean terminal near Los Angeles for the markets of the Orient. When the railroad agreed to extend tracks to the port, Wicks' company began round-the-clock dredging operations. The first passenger train, carrying 800 prominent and well- fed Angelenos, arrived at "Port Ballona" on August 24, 1887. However, after three years of dredging, the company's funds were exhausted and the harbor wasn't completed. Wicked tides and winter rains swept the sand back into the channel almost as fast as the dredger scooped it out. Worse, the dredge encountered a hard layer of red clay along the channel bottom that it had trouble penetrating. Finally, when a major storm in 1889 carried away most of Wick's wharf, the project was abandoned. In June 1902, Sherman and Clark announced the formation of the Beach Land Company, a syndicate of fifteen investors who had teamed up with Henry P. Barbour. He had previously purchased 1000 acres around the lagoon and renamed the community Playa del Rey (The King's Beach). The company intended to develop the marshy land into a Venetian style resort. The landscape architect, Alfred Solano, intended to take advantage of a channel previously dredged in 1885 for a proposed harbor. His design included Venetian bridges and towers, a bathing pavilion along the beach, and a 250 room luxury hotel on top of the bluffs. Some additional dredging was required but there were no plans to build an extensive canal network. Total investment exclusive of the hilltop hotel, which was never built, was $200,000. Nearly 100 lots were sold for prices ranging from $500 to $1500 at a July 16th auction and more were sold in August and September. 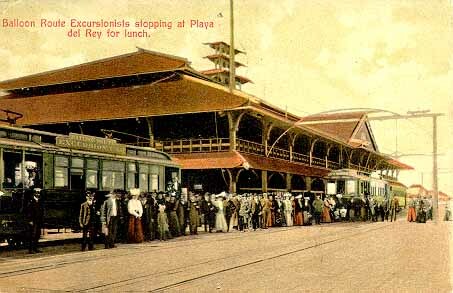 With the completion of the Sherman and Clark owned Los Angeles Pacific electric trolley line, the "Short Line," to Los Angeles on October 19, 1902, hundreds began visiting the new resort. A pavilion and small hotel were eventually built in Oriental craftsman rather than Venetian style, around the lagoon in 1904, but few investors actually built on their lots. While Playa del Rey was considered a modest success in attracting day tourists, it proved to be Abbot Kinney's inspiration and served as an example of a resort that wasn't large enough in scope to attract investors or excite the public. The company built an impressive three-story, $100,000 pavilion with restaurant and dining rooms, bowling alleys and dance floor. Sherman and Clark's Los Angeles Pacific Railway Company built the $200,000 Hotel Del Rey with fifty guests rooms. A boat racing course was laid out and a grandstand and boathouse erected on shore. A bridge spanned the lagoon's ocean entrance and a 1200 foot long fishing pier was built nearby. While Playa del Rey wasn't nearly as popular as nearby Venice, it partially owed its success to C.M. Pierce who included it on his Balloon Line Excursion Route. For $1.00 tourists could ride big red electric streetcars from downtown Los Angeles and visit Hollywood, the Sawtelle Old Soldier's home, Santa Monica, Venice, Playa del Rey (where lunch was served at the Pavilion), Redondo Beach's Long Wharf, and return to Los Angeles. They would often move 2000 people to Playa del Rey and back on a Saturday or Sunday excursion. The Balloon Route Excursion stopped at Playa del Rey's Pavilion Restaurant for lunch. The resort had several other attractions over the years. An incline railroad was built up the side of the palisades to give tourists a panoramic view of the lagoon and seashore. Its two cars were named Alphonse and Gaston. In 1913 racing promoters build a Motordrome which featured a mile circumference wooden track. Auto races there featured Barney Oldfield and other pioneer race car drivers. The track, which was near the present day intersection of Culver and Jefferson Boulevard, burned the following year. But as times and tastes changed just prior to the first World War, the town's tourist facilities were damaged or destroyed by nature. A large portion of the fishing pier collapsed in July 1911 and again in July 1917. Tide gates, which maintained high water in the lagoon, had to be dynamited during a heavy winter rainstorm because nearby Venice and the vast flat ground between became flooded. Soon the grandstands were torn down and sand clogged the boat course. The pavilion burned before the war and the Del Rey Hotel, which had become notorious as a house of prostitution in 1917, burned in a disastrous fire on May 31, 1924. The building, that was being used as the Hope Development School to house mentally retarded girls, was the scene of a tragedy involving the death of 22 girls and the matron, Mrs. J.C. Thomas. While Playa del Rey has since grown into a bedroom community along the beach, much of the lagoon was lost when Ballona Creek was channelized in 1938 by the Army Corp of Engineering, and when the Marina del Rey's wide entrance channel cut the lagoon in the early 1960's.